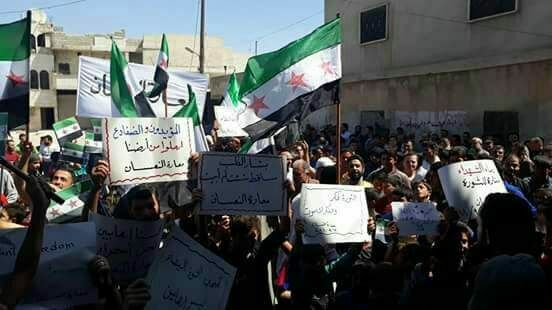 Support the Undaunted Revolutionary People resisting against the Final Onslaught of Assad and imperialist Russia against the last Citadel of the Syrian Revolution! 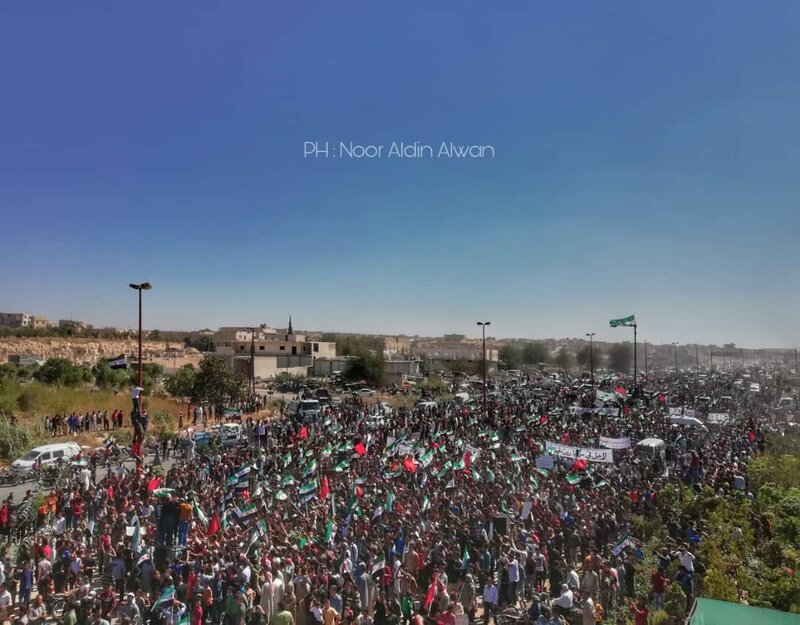 Note of the Editorial Board: This article include a number of pictures, video links and a map which can be viewed below. 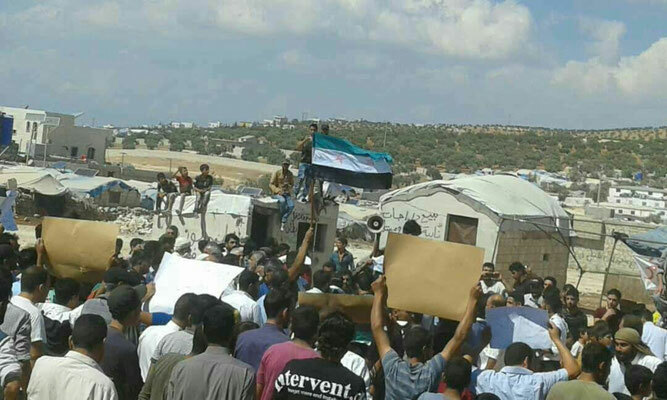 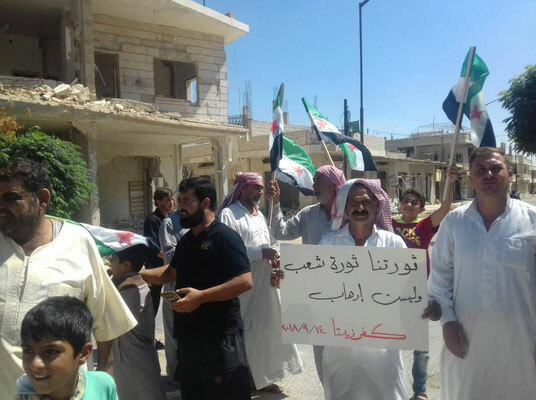 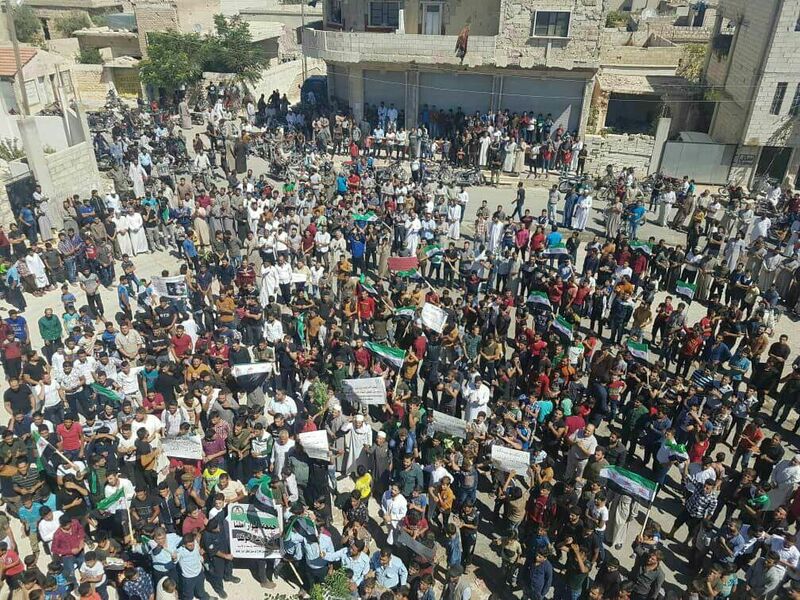 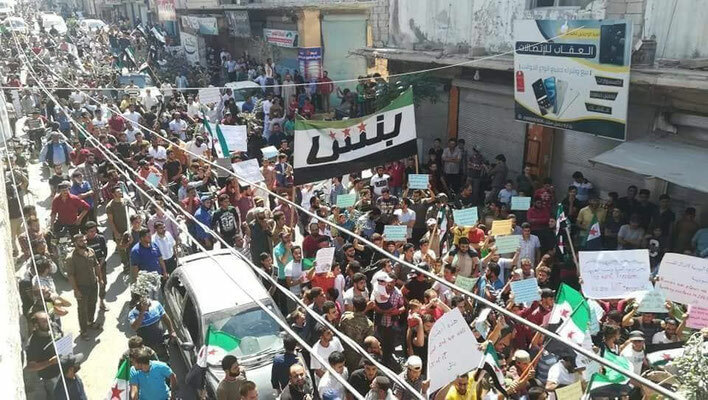 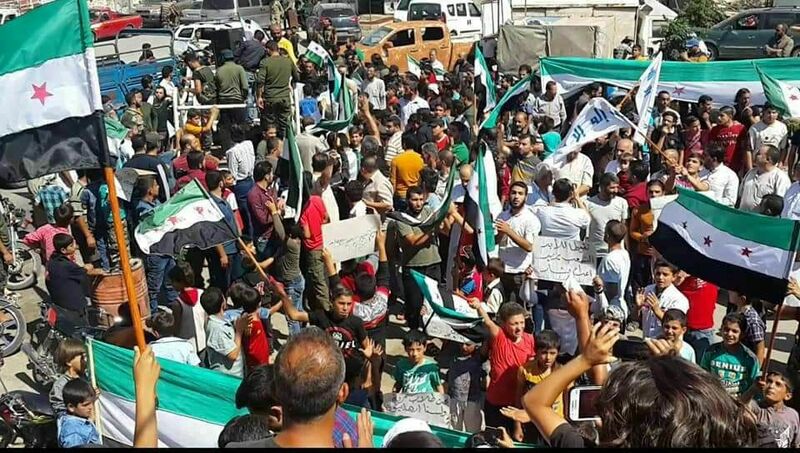 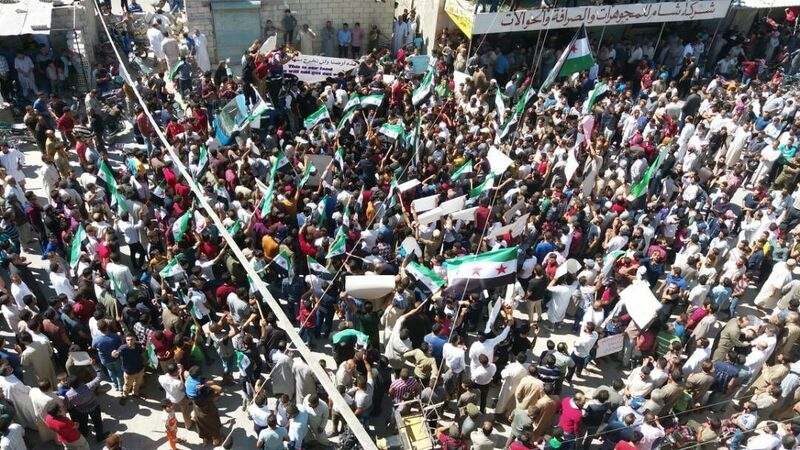 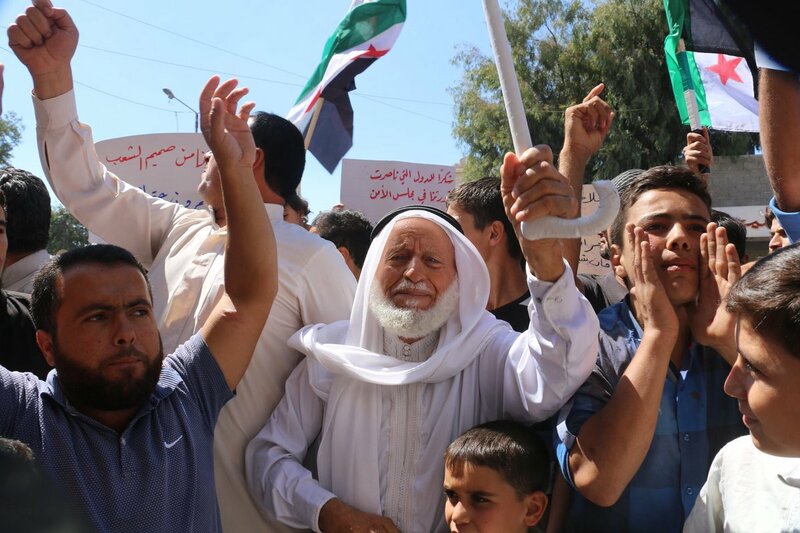 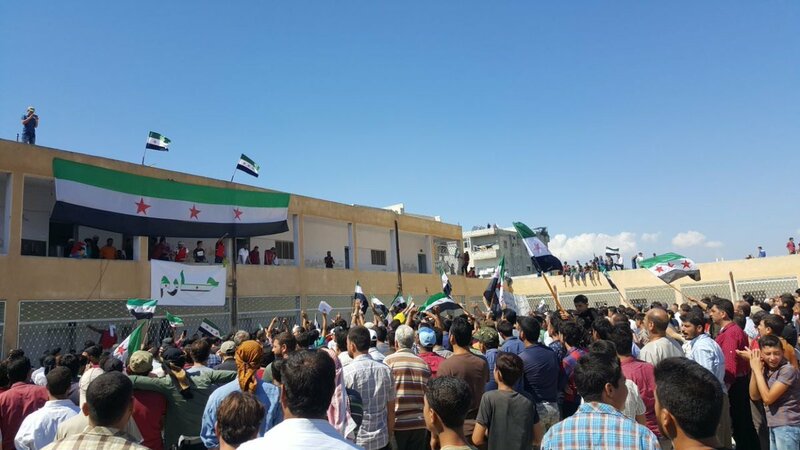 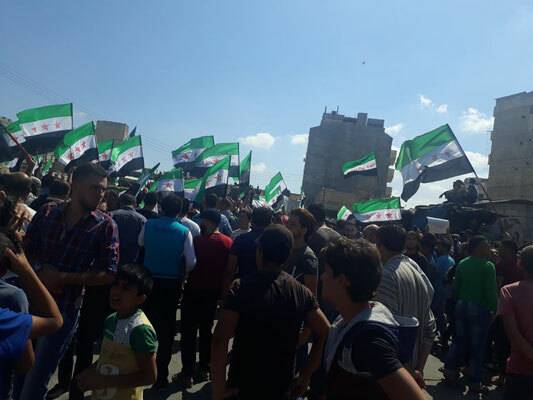 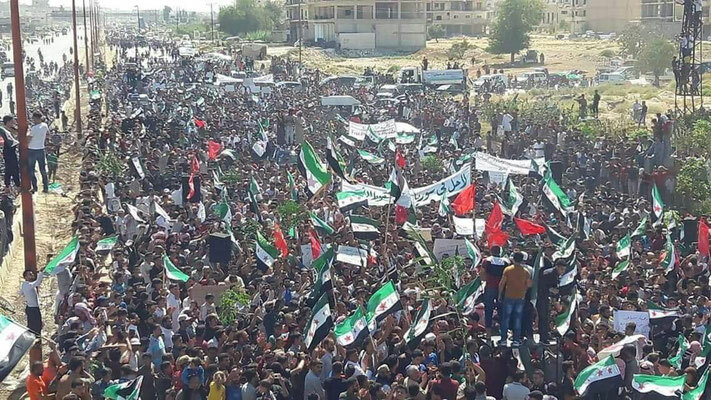 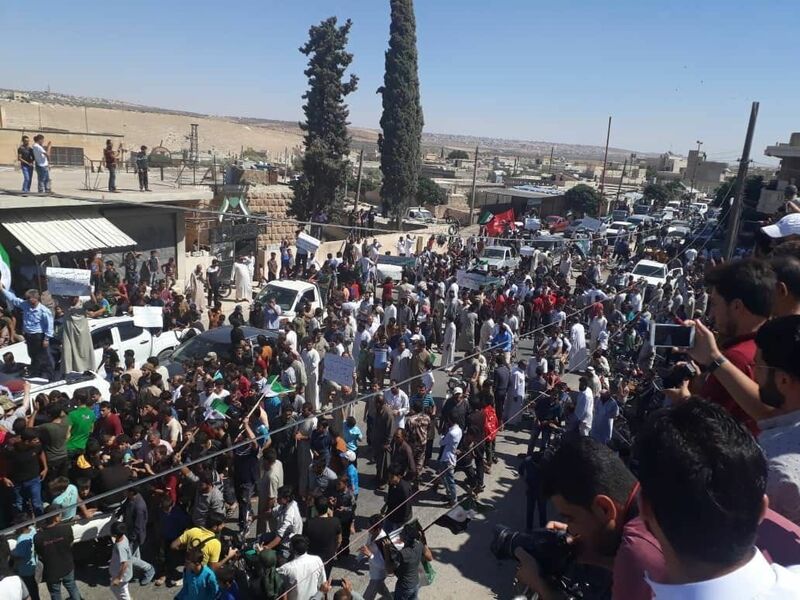 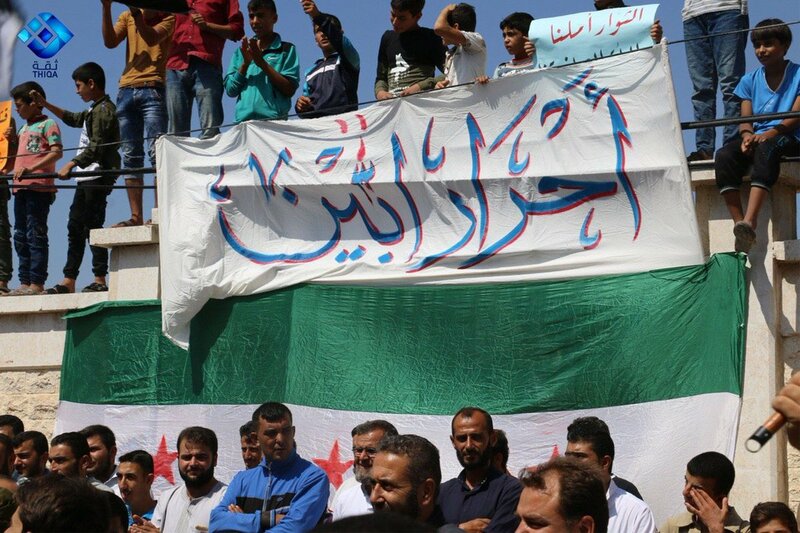 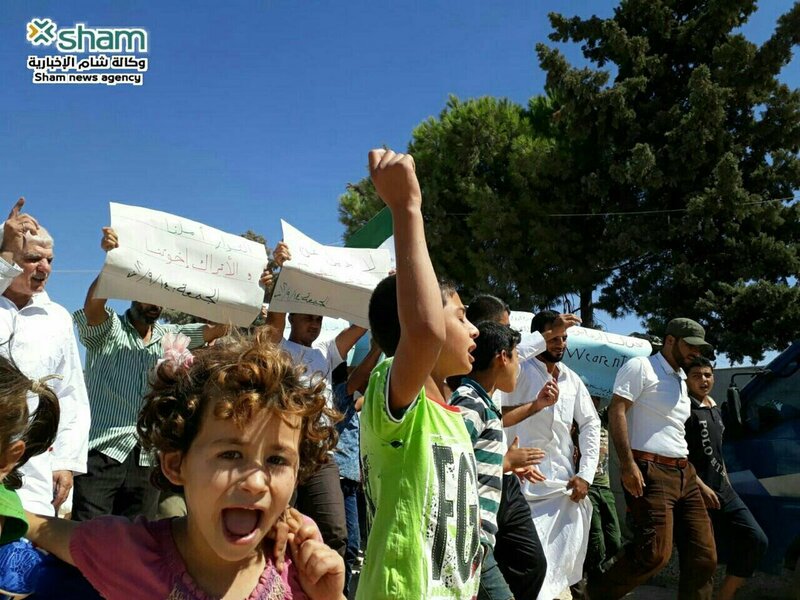 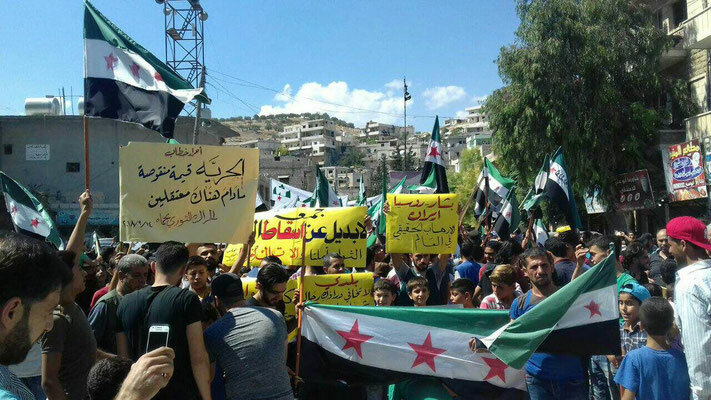 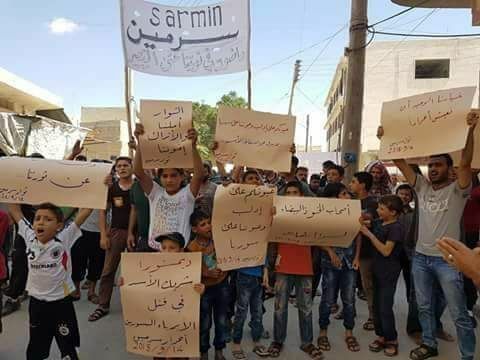 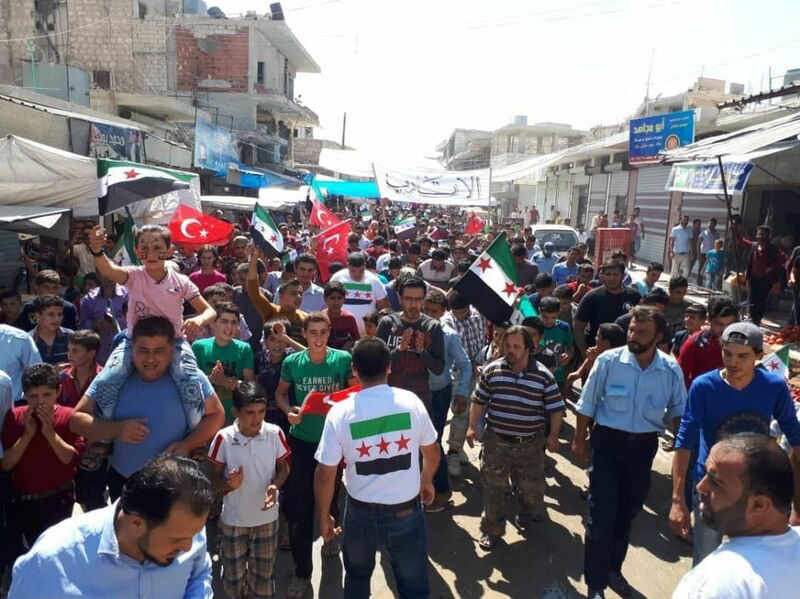 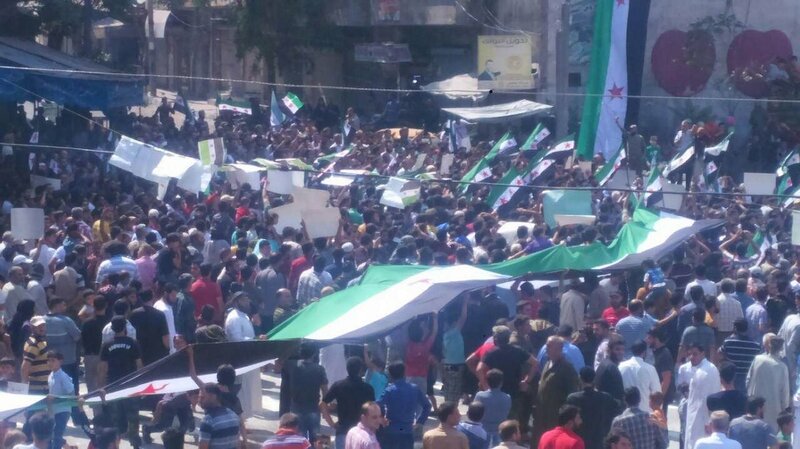 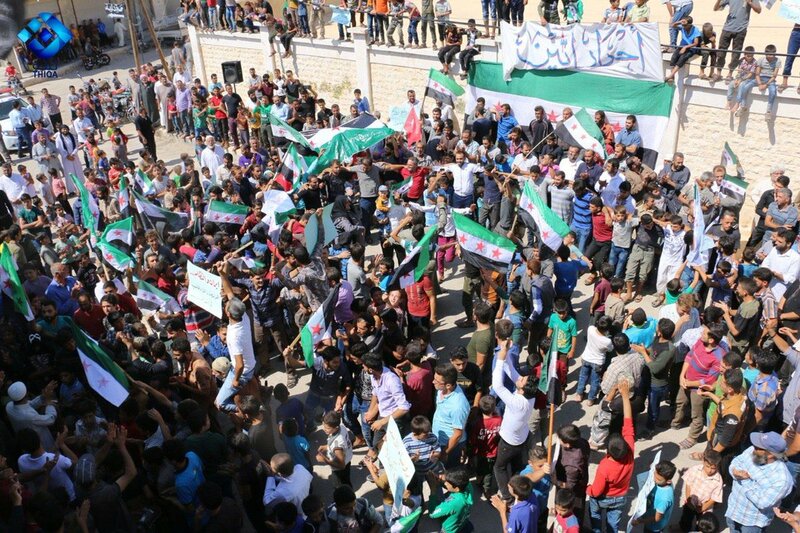 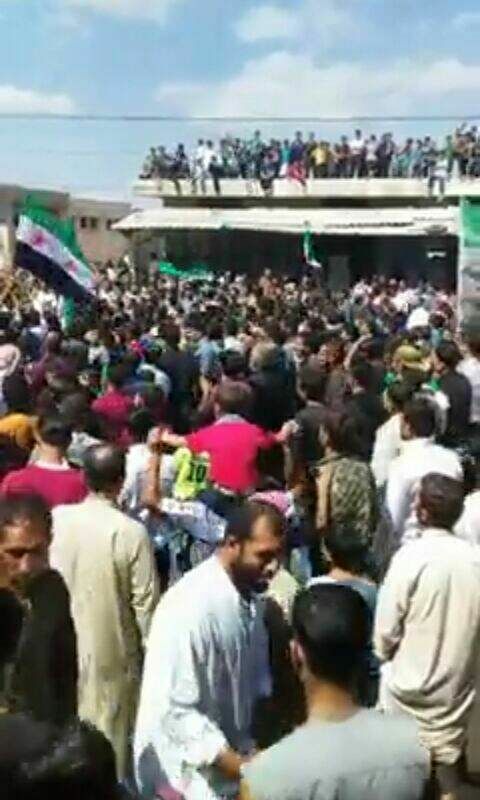 Tens of thousands people demonstrated in 83 cities and towns in the Greater Idlib region against the Assad tyranny and imperialist Russia on Friday 14 September. 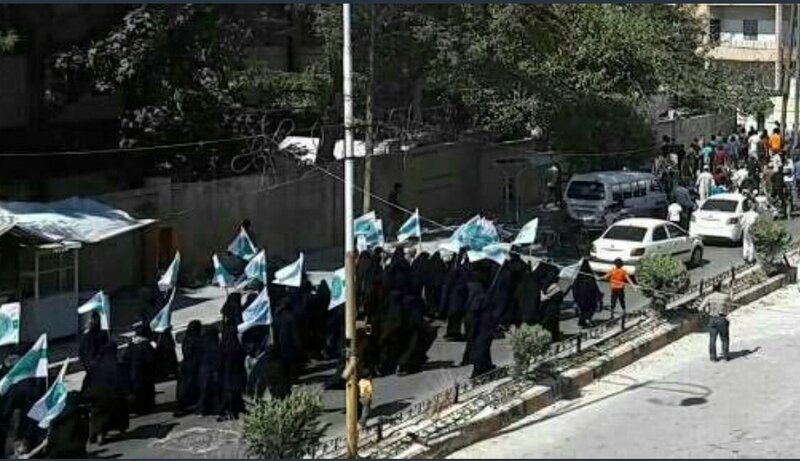 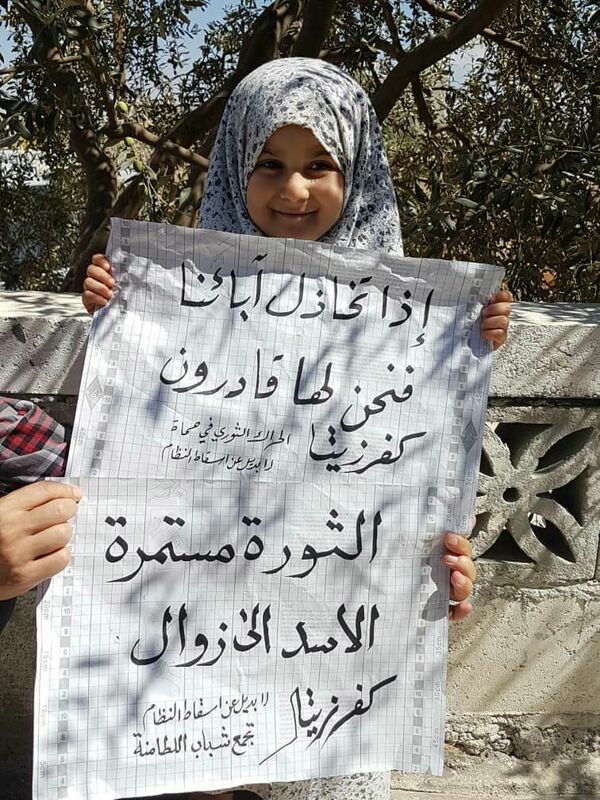 (1) In what many people say were the largest mobilizations since the early days of the revolution in 2011, people chanted slogans for the downfall of the regime. 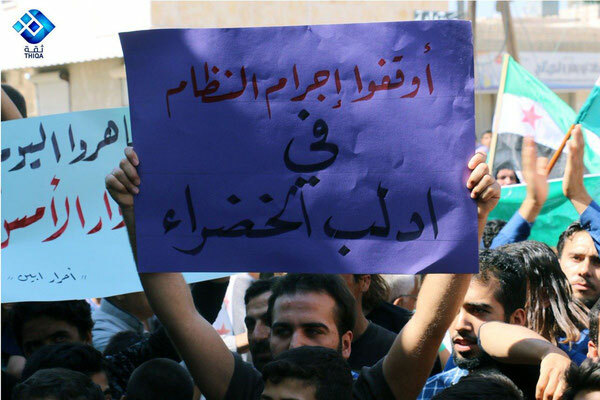 They denounced any attempt for reconciliation with the regime. 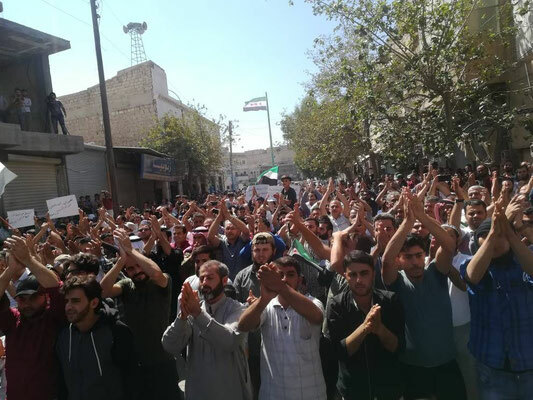 These demonstrations reflect that the will of the revolutionary people to continue the struggle against the barbarous Assad regime is undaunted. They also reflect the unabated mass support for the current leaderships of the popular uprising – mainly the petty-bourgeois Islamist Hayyat Tahrir al-Sham (HTS) as well as the petty-bourgeois nationalist/Islamist Free Syrian Army / Jabhat al-Wataniya lil-Tahrir. 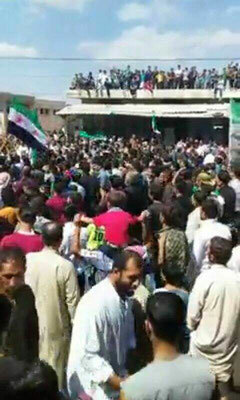 Later, in a second phase, the regime forces would try to conquer the rest of the liberated area. 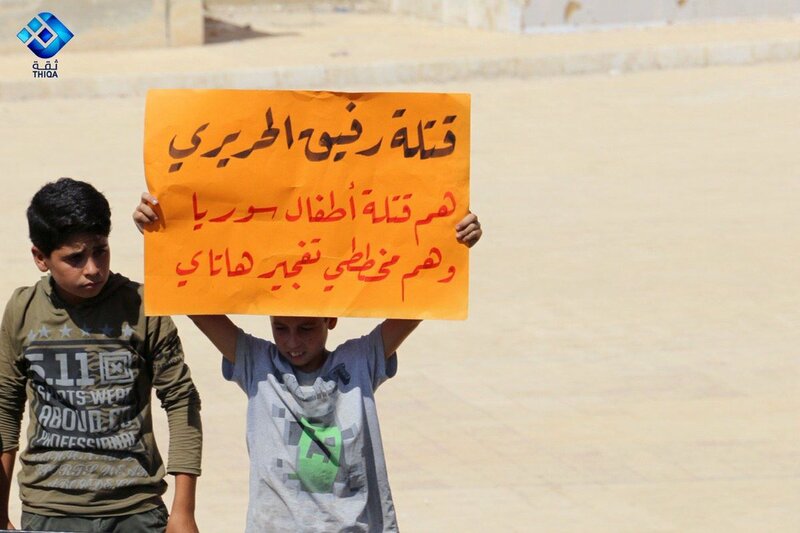 In any case, there is no reason to assume that the aggression against Idlib is about to end. 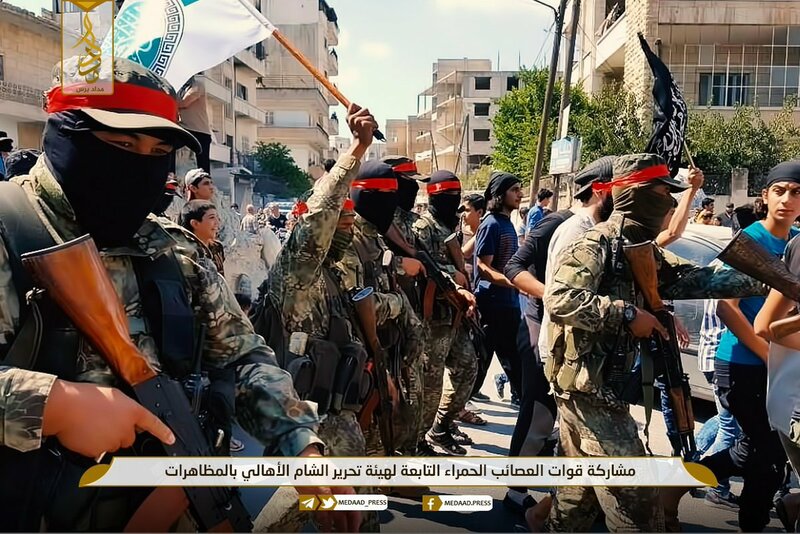 At the same time, the Putin regime emphasizes that its attempts to annihilate those forces most determined the liberation struggle (the “al-Qaida terrorists”) will continue. Its tactic is the old “divide et imperare” policy which the Roman Empire already deployed with success. 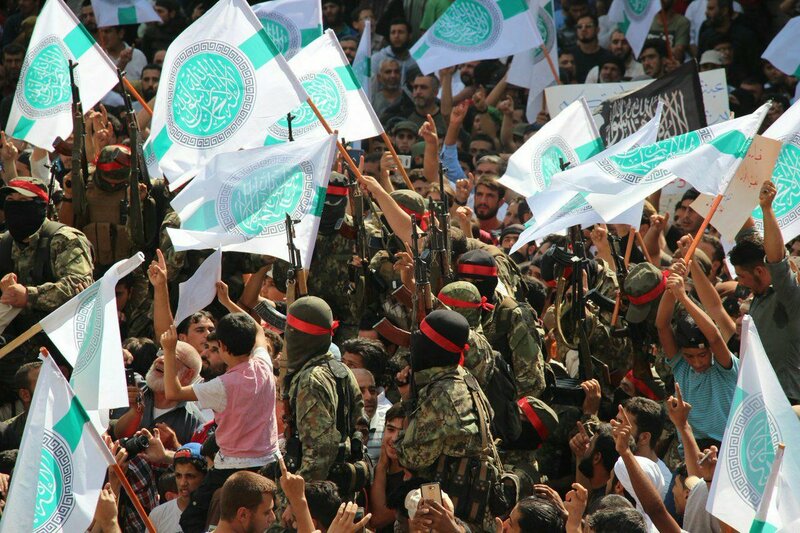 At a meeting with his German counterpart Heiko Maas in Berlin, Russian Foreign Minister Sergei Lavrov said that there will be no reconciliation offered to the “terrorist forces” like Hay’at Tahrir Al-Sham and the Turkestan Islamic Party. For this reason the Erdoğan regime is willing to collaborate with Assad and Putin in attempts to eliminate the most determined forces of the liberation struggle against the Assad tyranny (like HTS, TIP, HaD, etc.). 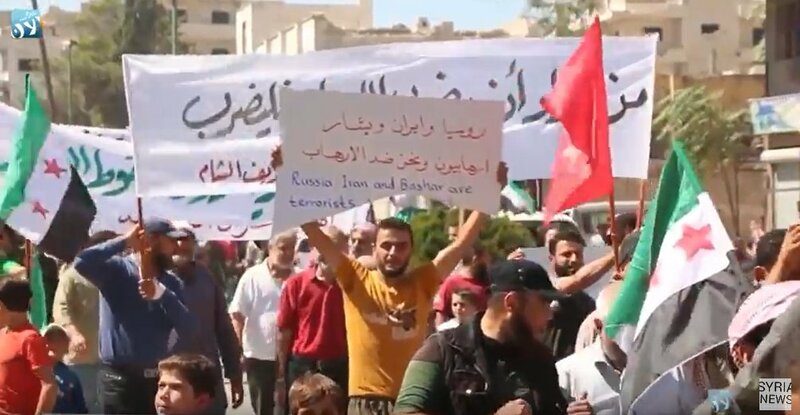 Ankara recently declared the HTS as a “terrorist organization” (as Russia, Iran and the USA did before). Of course, open attempts of the Turkish army to military smash the HTS and allied forces would be very risky for Ankara. 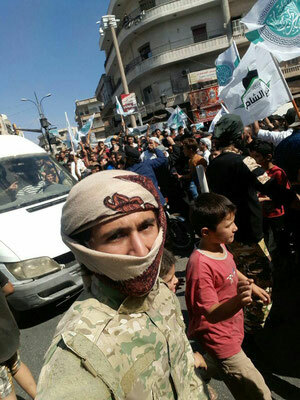 First, it would be very difficult given the military strength and the popular support of the HTS. Secondly, it would massively damage Turkey’s reputation not only among the Syrian people but in the whole Muslim world. 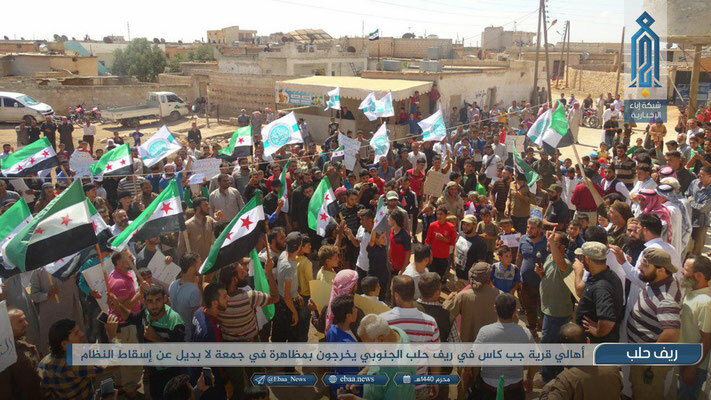 Hence, until now, Ankara has focused its attempts to smash the HTS on a) encouraging and supporting pro-Turkish FSA factions to attack HTS and b) a systematic campaign of assassinations against HTS commanders and militants. 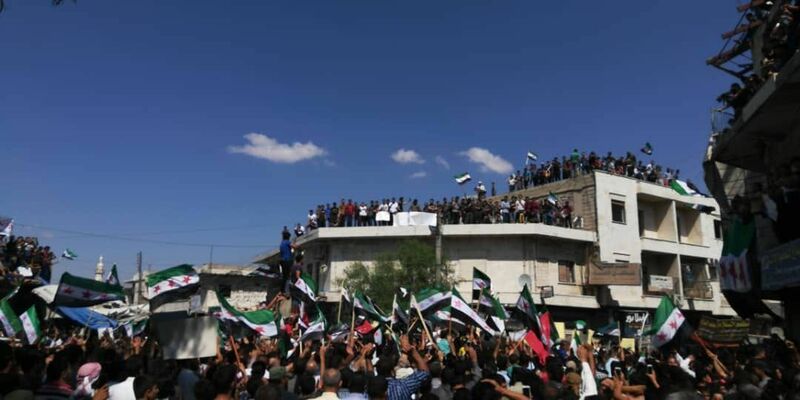 In other words, the liberations fighters in Idlib must prepare for a full-blown attack by the Assadist and Russian forces while taking precautions against a stab in the back by the Turkish forces or their local allies. An unbelievable difficult and challenging task! International Solidarity with the Revolutionary People in Idlib! The RCIT repeats its call to the workers and popular mass organizations around the world to rally in support of the Syrian people! 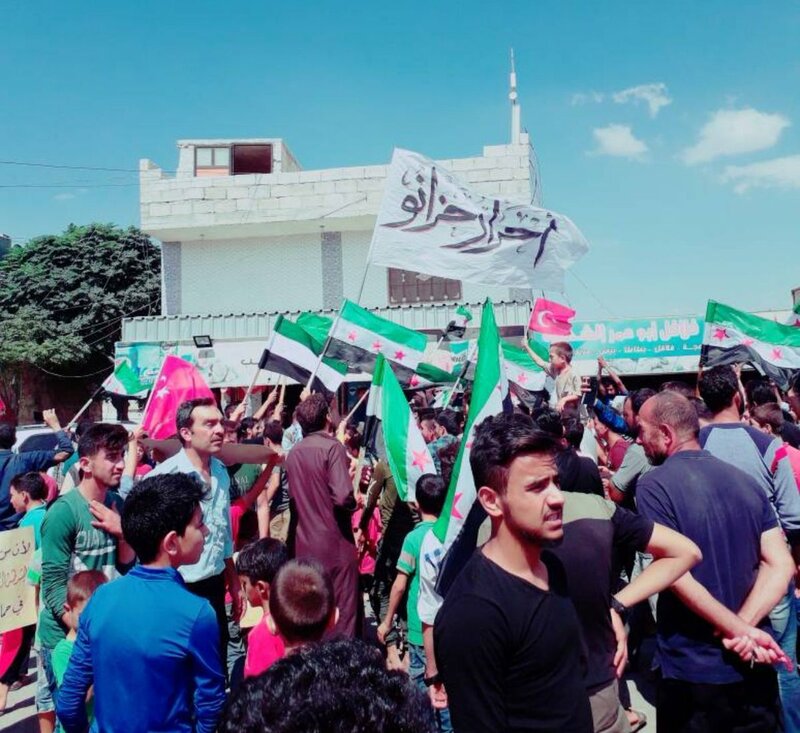 Defend Idlib, the last citadel of the Syrian Revolution, against the impending annihilation by the barbaric counter-revolution! 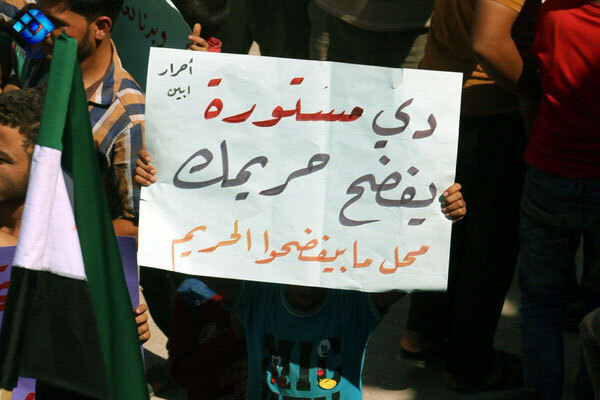 Oppose any sellout and any “reconciliation deal”! 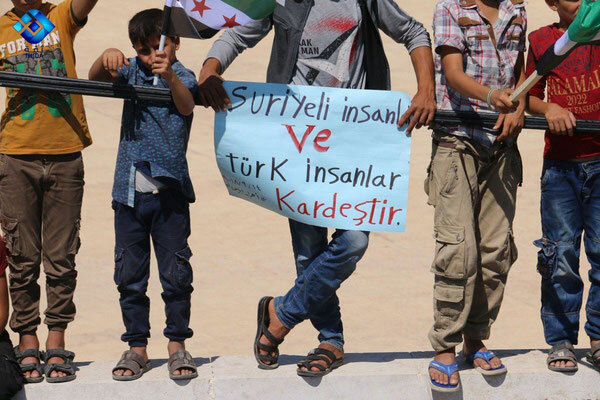 Denounce the interference and aggression of all imperialist Great Powers in Syria! 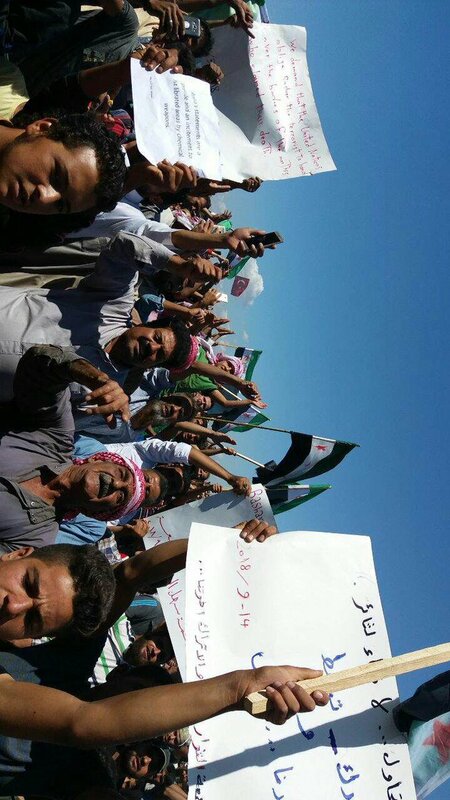 (19) For the immediate withdrawal of the Russian and U.S. troops as well as those of Iran and Turkey! 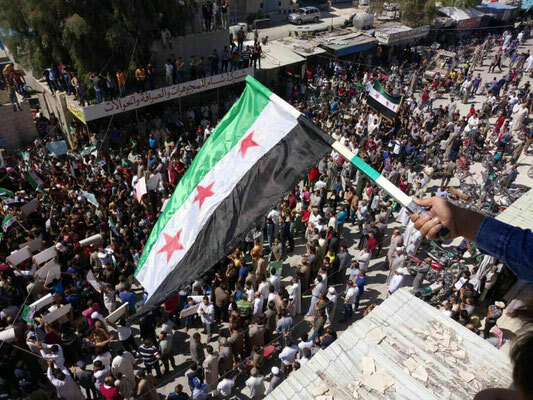 All foreign military bases in Syria must be dissolved! * Defend Idlib! 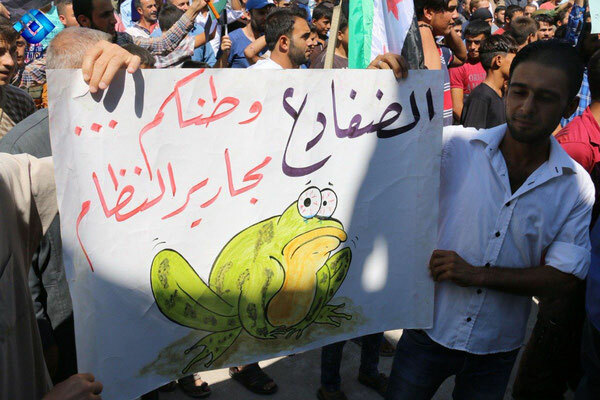 Defeat the Assadist, Russian and Iranian forces! * Oppose any sellout and any “reconciliation deal”! 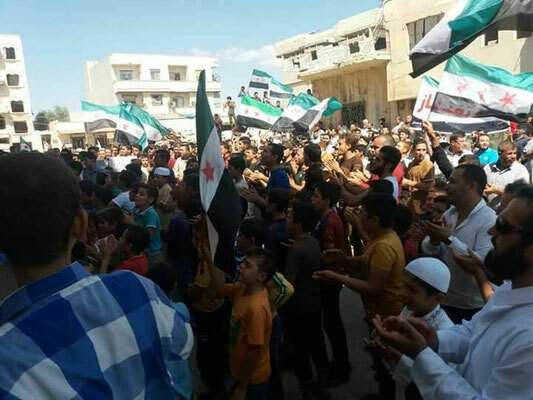 * Russian, Iranian, U.S. and Turkish troops – out of Syria! 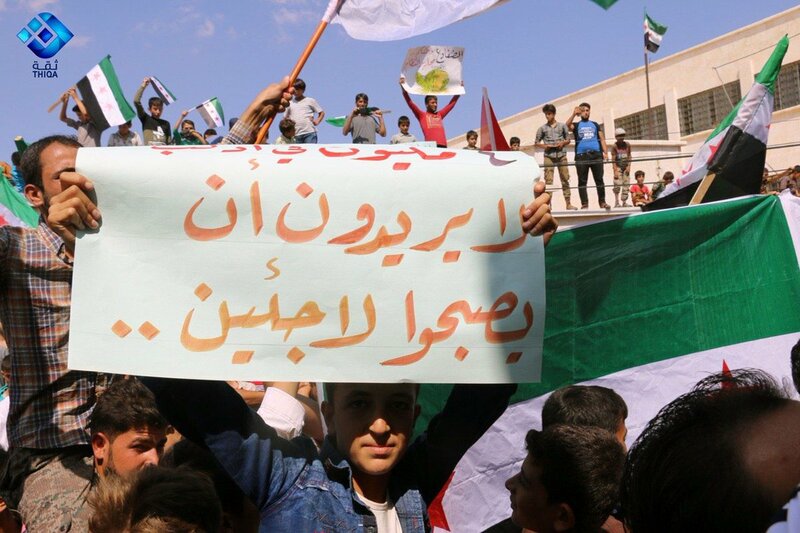 * Down with the counter-revolutionary Astana Negotiations! 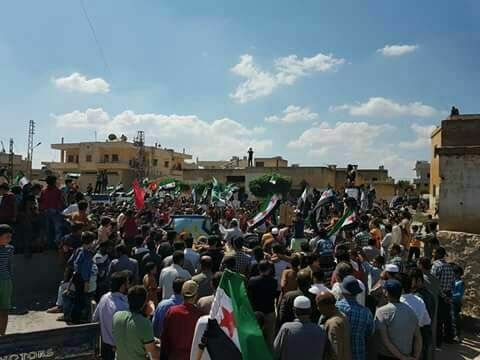 * For a single Intifada from Idlib to Jerusalem, Basra, Cairo and Teheran! 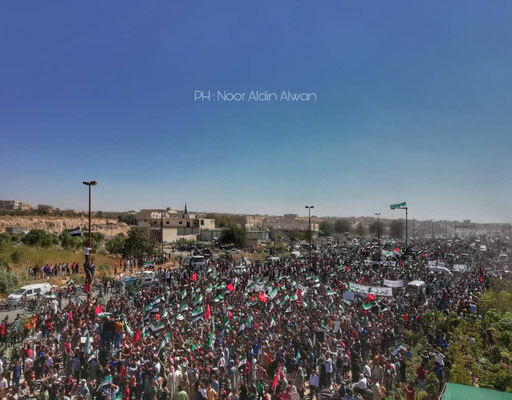 * Build a Revolutionary Workers Party – nationally and internationally! 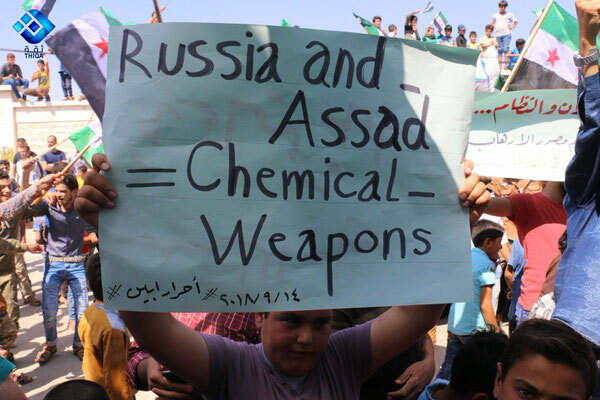 (5) On the RCIT’s assessment of the Astana deal see e.g. : Michael Pröbsting: Syrian Revolution: The Moment of Truth is Approaching! Rally to defend the Syrian Revolution against the Imperialist conspiracy called the "Astana Deal"! 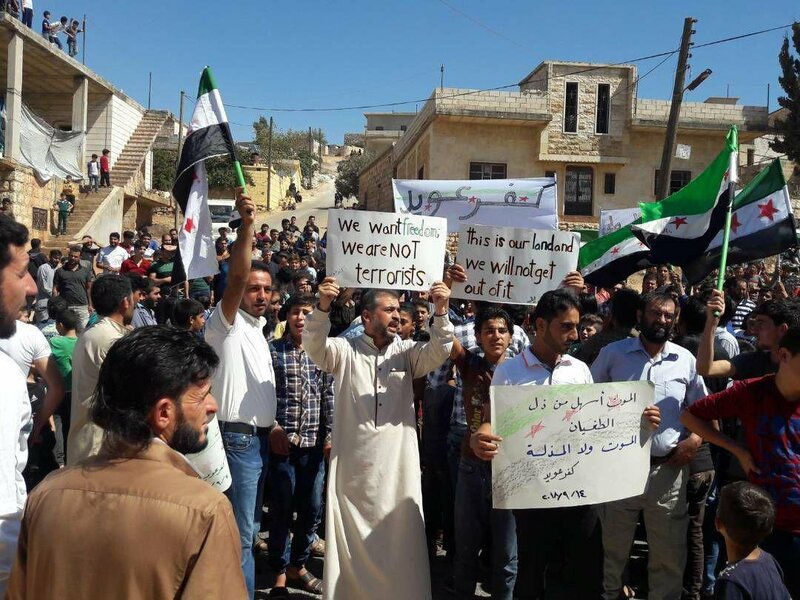 20.09.2017, https://www.thecommunists.net/worldwide/africa-and-middle-east/syria-moment-of-truth-approaching/; RCIT: Syria: Defend Idlib against the Great Powers! Down with the reactionary Astana Deal! Defend the Revolution against the butcher Assad, against Russian and US Imperialism and the local Allies! Victory to the Struggle of the Workers and Oppressed! 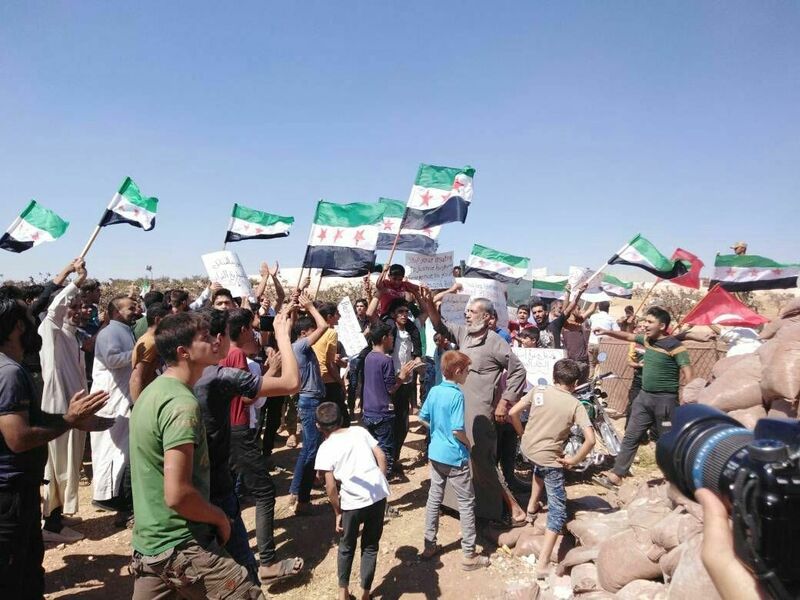 04.08.2017, https://www.thecommunists.net/worldwide/africa-and-middle-east/defend-idlib-against-great-powers/; Michael Pröbsting: Syria: The Astana-Deal Struggle Intensifies. Some Notes on Recent Developments in the Syrian Civil War and the Dangers for the Liberation Struggle, 28 July 2017, https://www.thecommunists.net/worldwide/africa-and-middle-east/syrian-revolution-28-7-2017/; RCIT: Syria: Condemn the Reactionary Astana Deal! The so-called "De-Escalation Zones" are a First Step towards the Partition of Syria and a Conspiracy by the Great Powers to Defeat the Revolution, 7 May 2017, https://www.thecommunists.net/worldwide/africa-and-middle-east/astana-deal/; Michael Pröbsting: Is the Syrian Revolution at its End? 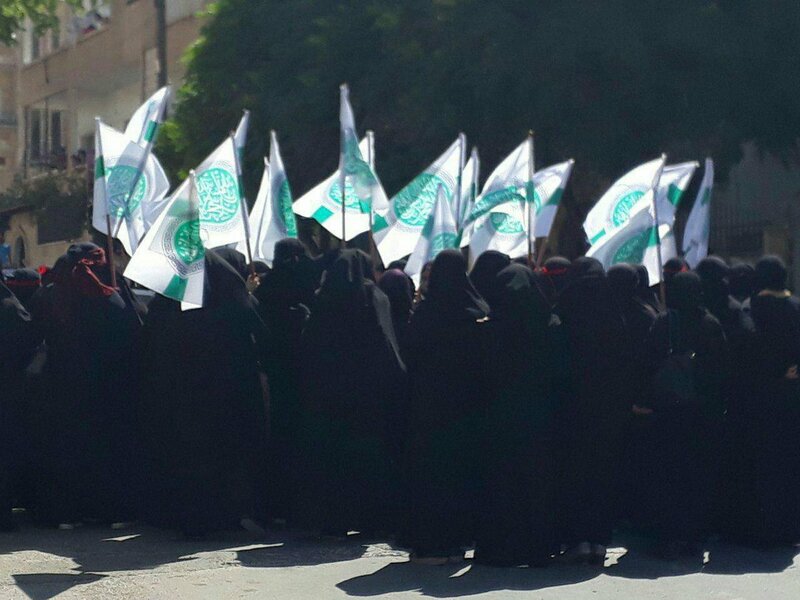 Is Third Camp Abstentionism Justified? 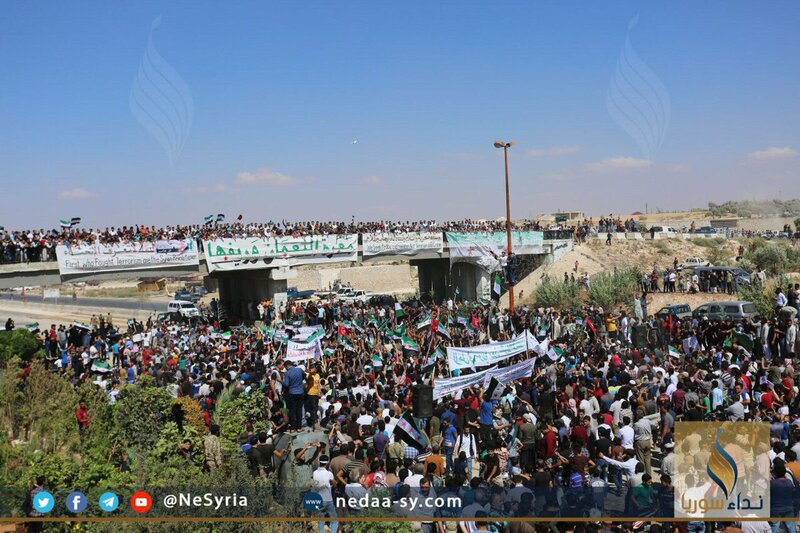 An essay on the organs of popular power in the liberated area of Syria, on the character of the different sectors of the Syrian rebels, and on the failure of those leftists who deserted the Syrian Revolution, 5 April 2017, https://www.thecommunists.net/theory/syrian-revolution-not-dead/ and chapter V of Michael Pröbsting: World Perspectives 2018: A World Pregnant with Wars and Popular Uprisings, February 2018, https://www.thecommunists.net/theory/worldperspectives-2018/chapter-v/. 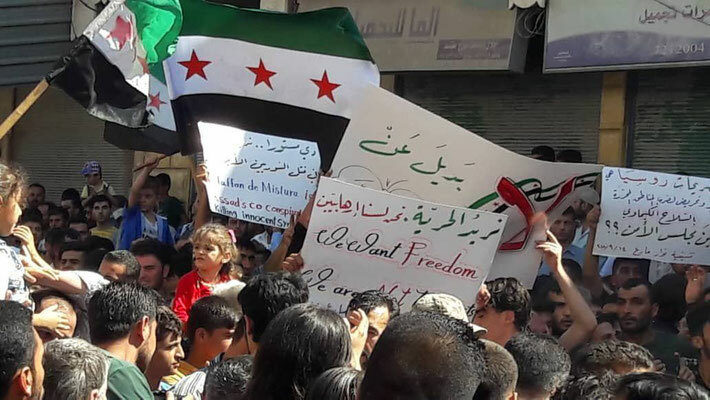 (6) We have elaborated our characterization of HTS in a number of articles and statements which are collected in a special section of our website: https://www.thecommunists.net/worldwide/africa-and-middle-east/collection-of-articles-on-the-syrian-revolution/. 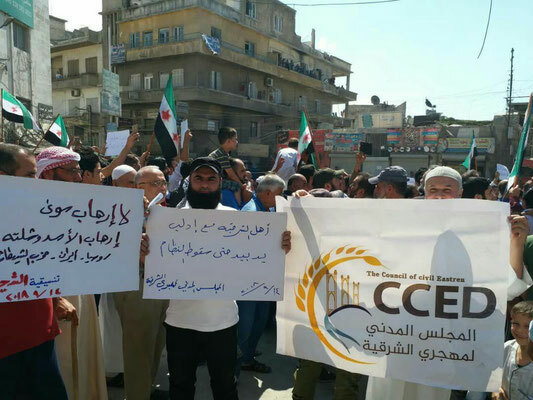 In particular we refer to RCIT: Denounce the US terror listing of Syria’s Hayyat Tahrir al-Sham! 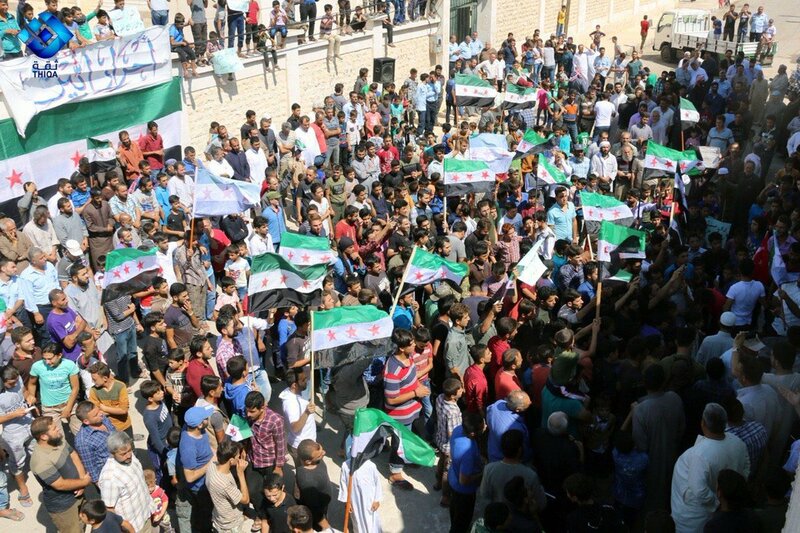 The Trump Administration delivers another blow to the Syrian Revolution. Continue the Solidarity with the liberation struggle of the Syrian people! 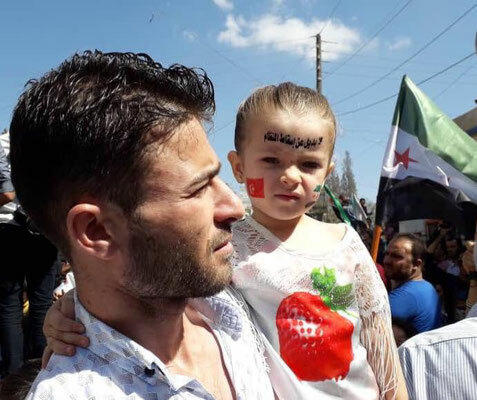 03.06.2018, https://www.thecommunists.net/worldwide/africa-and-middle-east/denounce-the-us-terror-listing-of-syria-s-hts/ Michael Pröbsting: Syria/Idlib: The Attack of the Astana Conspirators could be repelled thus far, 05.03.2018, https://www.thecommunists.net/worldwide/africa-and-middle-east/syria-idlib-the-attack-of-the-astana-conspirators-could-be-repelled-thus-far/; chapter V of Michael Pröbsting: World Perspectives 2018, https://www.thecommunists.net/theory/worldperspectives-2018/chapter-v/.